September | 2017 | shigekuni. I picked up this book in a Parisian comic book shop yesterday and read it all the way through on the Metro ride home. Granted, it’s not very long. That said, I haven’t been this impressed with a comic book purely by the way it’s written in a long time, so I’m sitting here to give you a quick shove. Go read this book. 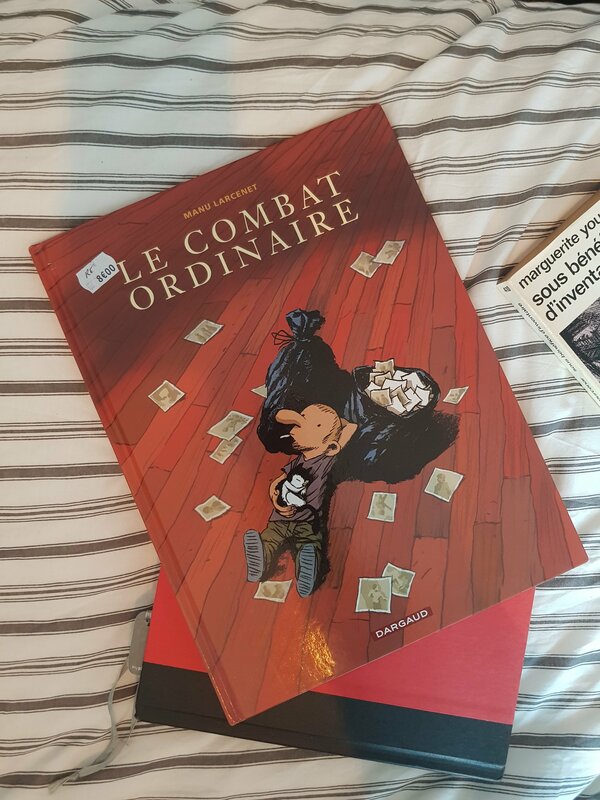 It’s called Ordinary Victories in English translation (published by Europe Comics), but there’s nothing ordinary about it. My caveat here_ I’ve only read volume 1, God knows the book might fall apart in later installments (there are four overall), but I cannot see that happening. Manu Larcenet is a fantastic writer, whose artwork unexpectedly complements his stories of love, heartbreak, war and disillusionment. I’ll admit – when I was recommended the book in the shop, I leafed through it, and wasn’t bowled over. Funny faces, bulbous noses, dudes smoking weed. None of this was new, none of this seemed worth the time and money to engage with it. For some nebulous reason I picked it up anyway, and I find it hard to summarize what an achievement I am finding this book to be. I was moved, not just by the awful cliffhanger ending to the book, but also by the enormous amount of humanity that Larcenet offers his readers. 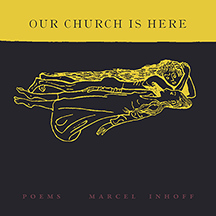 Ultimately, this book is about who we are as people, what we value and what holds us together as communities. Set against the backdrop of the 2002 Presidential elections in France, it asks us to understand what it means for France that a fascist, Jean-Marie Le Pen, was able to get into the runoff against Chirac, what it means for us on the left or even center that a substantial amount of the country could have embraced violent cynicism as a political philosophy. It’s curious that I am reading the book today, as Le Pen’s daughter has gathered an even larger part of the vote in the recent French elections, and Trump won last November’s election in the US, and this Sunday, our own fascists are poised to win a historic victory and become the third largest party in parliament. Reading it as a person who is questioning some of his own choices in life and trying to find the glue that connects him to other people, this comic had a particularly strong resonance. The protagonist is a 20something photographer who is unhappy about his job, though he still loves taking pictures, and has made enough money to be able to live (frugally) in the countryside for a year or so without being forced to take another job. He doesn’t do a big sweeping assessment of his life – he just takes down all his photos, and takes walks through the countryside with his rancorous cat Adolf. He meets farmer, smokes some weed, and, eventually, through an injury to his cat, falls in love with a veterinarian with whom he begins a loose relationship. The book begins on a psychoanalytic couch, and we may want to read his trip to the sticks as a kind of liberating move, but we quickly realize that it is his way of hiding from the issues and forces in his own life. This personal journey is however quickly buttressed by a nastier political theme – his father’s (and France’s) past during the Algerian war. 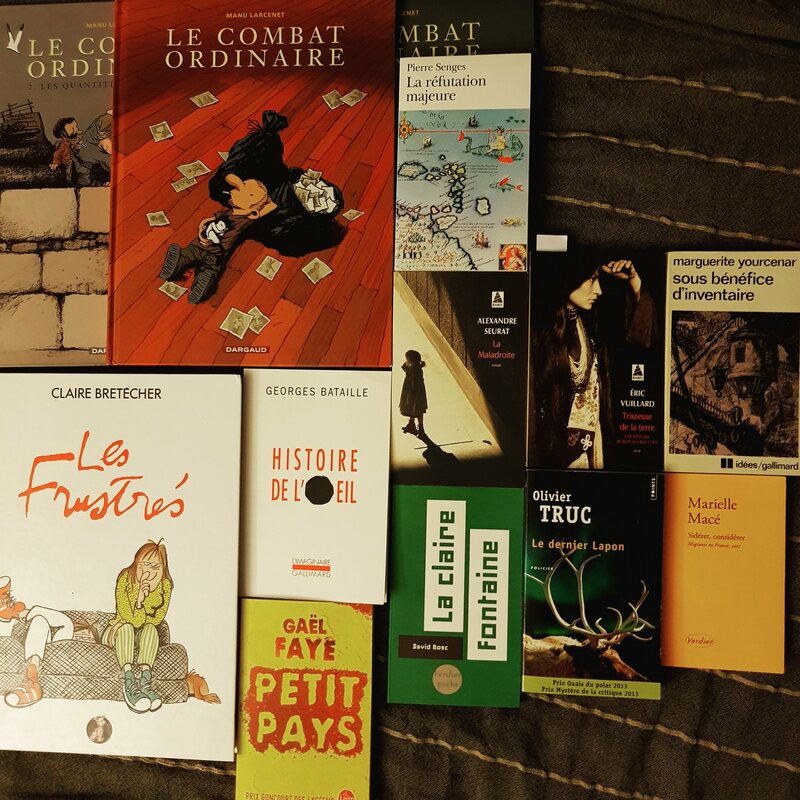 The common practice of torturing Algerians during that war rears its ugly head as the book progresses, again, echoing the Presidential elections that happen during the events of the book, with one of the candidates running, Mr. Le Pen, having himself participated in acts of torture. There are no flashbacks (yet), instead we learn much of the Algerian war background of some of the protagonist’s characters, including his father, in stray sentences and one dialogue. Fittingly for the protagonist’s profession, it is a photograph that sets that whole discourse in motion. In retrospect, after finishing the book, it is quite remarkable how efficient, how sharply structured and how overall well made the book is. For all that the book may seem meandering at the beginning, everything in it serves a purpose – this kind of unassuming density is always impressive to me. It means the author has a solid control both of his ideas and the way he wants to deliver them, as well as of the craft of just telling a story with well-rounded characters. Even those characters that we never really get to know are written in a way where we can glean some additional, fuller dimensions. The only downside to the book is its extensive maleness – the main character is a man, and his interlocutors are all men, except for his girlfriend, his mother, and his brother’s wife. Of these, his brother’s wife is the most independent – she confronts him once about his behavior, but is shown to have a whole life outside of the main protagonist’s travails. His girlfriend merely serves as a foil. Now, I understand that this is a story about this one man, and some of the maleness is inherent in the material. What’s more, the male farmers, his father, and his own gender form a kind of connection to the people who have largely been responsible for the political drama, both in the present of the book, as well as in the French past: white French men. I sort of expect the other volumes to draw more on the connection here, and it’s certainly an interesting and relevant path of thought. At the same time, introspective books by men about the deleterious effects of masculinity are as common in literature as croissants in French bakeries, and I must admit that I am slowly tiring of finding yet another text caught in the maelstrom of the (self-critical) male ego. At the same time, it’s a sign of how fantastic this particular text is that I still enjoyed it greatly, bulbous noses and bulbous egos aside. This is a very good comic and you should read it. Also, it has an adorable cat! This is a good book. Meral Kureyshi is a Swiss-Albanian writer who is part of that country’s Turkish minority. At the age of nine, she moved to Switzerland, where she still lives and writes. 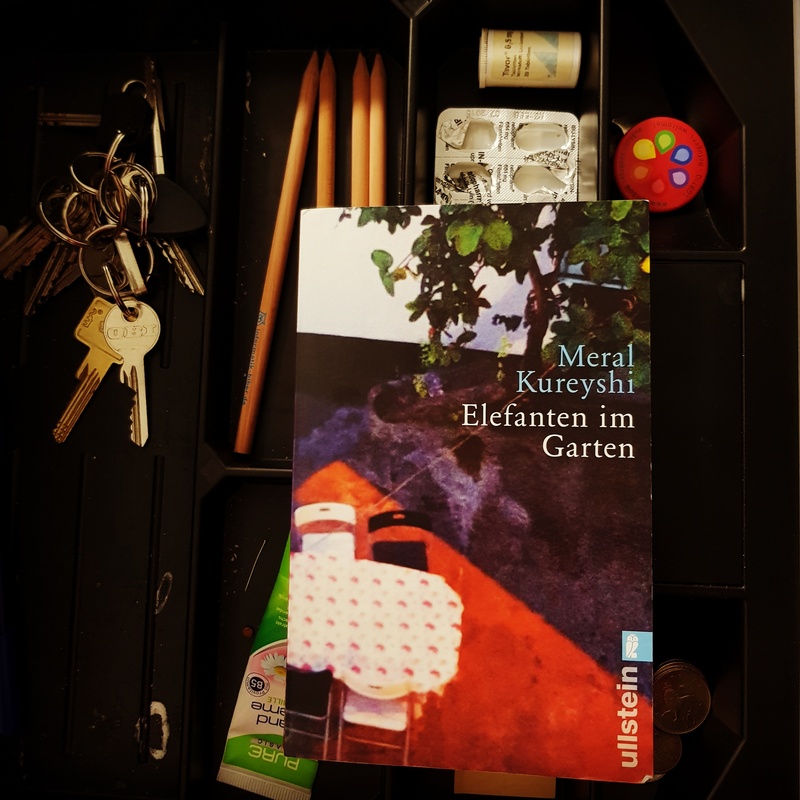 Her novel Elefanten im Garten, which someone should be translating into English ASAP, talks about a girl with similar experiences. At the center of it are the feelings of displacement and alienation that accompany many refugee narratives. The novel’s protagonist is a refugee, who, when she loses her father, goes into a bit of a tailspin, reevaluating her life. The novel recounts that life in fits and starts, moving back and forth through time, offering us a disjointed chronology that reflects the disjointed biographies of many people who have left their home without being allowed to find a new home in the place they arrived. Kureyshi offers us a novel written in a poetic style, although you can tell the MFA trained writer in the self-conscious way she sometimes presses the poetic elements to the point of offering the occasional Coelhoite banality in the guise of a moving sentence. The flourishes that permeate the book are not its best element – she is best when she allows her observations to stand on their own, but she also has an interesting gift for structure and how to make stories like hers cohere. Her tendency to offer a pretty poetic bow to the sharp unsalted substance of her tale is regrettable, because it keeps us from finding her voice in the text as much as we should – it also invites comparison with other, somewhat better texts and writers, the most obvious of which -to me- was Aglaja Veteranyi. Veteranyi was exceptionally skilled at giving us a moving tale with political relevance, where poetical flourishes enhance rather than cloud the author’s work. You can get Veteranyi’s slim oeuvre in English, and one wonders whether the loud echoes of her work in Kureyshi’s book are an indication that her work is taught in MFA courses and schools as one way to deal with this specific kind of material. Don’t get me wrong – I may have complaints, but Elefanten im Garten is definitely a good book, and one that is both moving and – especially given today’s politics- politically relevant. The book is structured in many small blocks of text, too small to be called chapters, although they are themselves structured in larger groups which resemble chapters but are never named as such explicitly. These groups advance a topic, or an element of the plot, and within the groups there are bits set in the past, bits set in the present, offering, in effect, a sort of complete set of the protagonist’s context for a specific observation or memory. There is this strong sense, within each of these groups that we are the sum of our memories and to understand an emotion in the present we need to understand the deep impression left on us by the weighty pressure of the past. This coherence then allows Kureyshi to be much less obviously structured in the way she arranges the groups. It is only after a while that we notice we were slowly fed more and more details, that Kureyshi slowly builds one element on the other. Much as they do in Veteranyi’s work, repetitions start to weigh on us as we make our way through Elefanten im Garten. 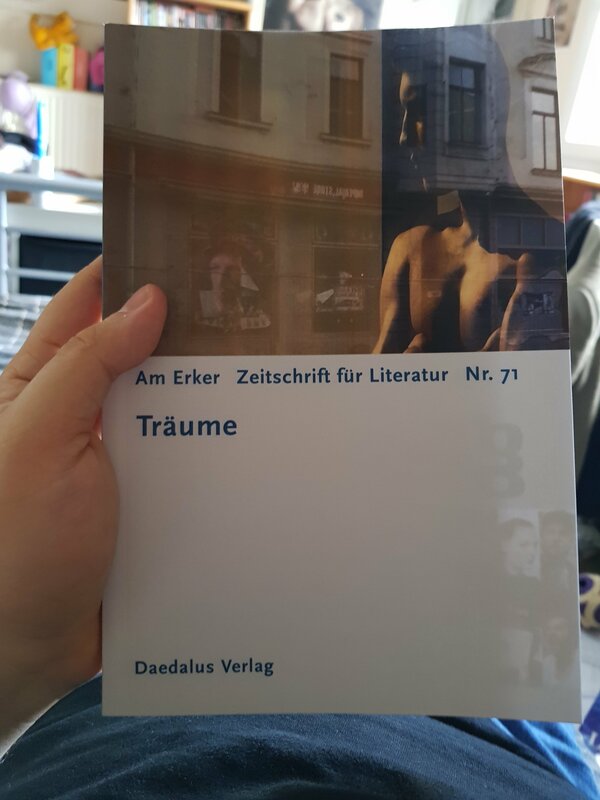 We learn that the protagonist’s father died early in the book and that this precipitated much of the soul searching, the “Das dreißigste Jahr”-styled attempt to find herself which comprises the events in the novel’s present. Only as we pass through the novel do we slowly understand why that death was so shattering. And we really do – the impatience of the writer to make us understand, to show us, to point to the important thing can be irritating, particularly at the beginning, when all the pointing is unearned, and in retrospect, when we see how the book itself does such a good, gentle, and moving job at pointing us in the right direction. One sentence early says “I looked for you in your diaries, but I found myself.” This is not a good sentence, and thank God the book doesn’t crawl with them. But that is an example of the author not quite trusting herself. We understand as we go through her memories and vignettes that understanding the things her father -Baba- did is also a mirror to her own life. One feels with some unease that the author was taught that this material would benefit from this kind of language, and this kind of obviousness – particularly since the work of Dorothee Elmiger, which I reviewed a few months ago, doesn’t contain any such superfluous pointing and waving. Elmiger is content to let the material accrue, to let the information and the stories and the allusions do her work for her. And Elmiger went to the same MFA program, the Literaturinstitut in Biel, but her material and approach is different. The heavy traces of Veteranyi in Kureyshi’s book leave me, as I said, uneasy. But maybe it’s not the MFA – maybe it’s just this incredibly talented debut novelist’s impatience to really make the book work, make the book speak to its audience. In a book I’ve been reading recently, Anne Katrin Lorenz discusses parrhesia and the way Foucault’s work shifts in relation to it. Ultimately, Lorenz says, Foucault lands on the importance of open speech as a form of self-care, making one’s life into art. Given the biographical overlap between Kureyshi and her protagonist, it’s hard not to see some of the way the novel is written as a kind of performance, a sometimes regrettably overdetermined, but always exciting dance on the page of speaking out, and needing this transformation of self into art to work. Some of the connections she makes are breathtaking, but subtle. Or breathtakingly subtle? For example, the use of colors. In the same group of blocks where she discusses the letters her family would receive from the state announcing the rejection of their stay in Switzerland, she also mentions winning a bike at a fair. The envelopes of the letters are yellow, the bike is orange and the only other colors mentioned in the group are two shades of red. This may seem minor but the theme and symbolism is part of what ties that group together and Kureyshi keeps doing things like this, seemingly effortlessly, and you follow her until she drops one of those clunky-poetic sentences on you. The poeticisms are all the more confusing because Kureyshi sometimes offers simple, plain sentences, simple, plain descriptions of things that happen, and these are among the most shattering parts of the book. She asks questions of her readers: what does it mean to be at home, if your residence can be revoked at any time. Do you understand the fear of living in suitcases, being prepared to leave the place whose language you know best? There is a lot of awfully complacent writing about refugees these days in German-language literature, and some confusingly clueless writing about Germans going abroad that would have been questionable in a 19th century novel. From Jenny Erpenbeck’s overwrought tale of German compassion and confusion to the traveling tales of Bodo Kirchhoff (whose offensively reactionary book Widerfahrnis won last year’s German Book Award) and Jonas Lüscher, whose debut Frühling der Barbaren feels like one of Fouad Laroui’s French characters wrote a book, and whose new book (longlisted for this year’s German Book Award) is another tale of an upper middle class German who feels put upon by women and travels abroad to find a solution to his very important problems. Writers like Kureyshi destabilize that literary complacence. Two other books on the topic, one that hasn’t come out yet (but is already longlisted), Sasha Salzmann’s Ausser Sich, and one that’s been out for a bit, Olga Grjasnowa’s Gott ist nicht schüchtern, are on my short short list of must reads. And Kureyshi should be on yours. None of the book’s minor shortcomings overshadow the book’s major virtues, and they are equal parts political and literary. This is the kind of debut novel that you squint at, saying: if this is her first book, how goddamn good will the next one be? And maybe graduating from the MFA school will reduce the group of teachers that push her to adopt other voices, like Veteranyi’s in this book, and increase the courage to push harder for her own. Because her voice needs to be heard. There are scenes here that I have never seen described or written before, filled with an awareness of how our world works – or indeed doesn’t work. 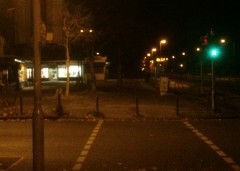 In one fragment, Kureyshi’s protagonist waits at a busstop with a man wearing the uniform of the Swiss army members of the KFOR soldiers stationed in Prizren. The man comes from the same village where the protagonist grew up, and Prizren is where her family is from. She makes him aware of this coincidence, and he nods and turns away. This scene is described in incredibly precise language, it ends on a simple declaration, but also contains a small borderline surreal element. I have never read a scene quite like this before – and for something to be entirely new to me, that’s not very common. Literature that surprises me, that moves me, that angers me – that’s literature I want to read, particularly when it’s mostly well written. German is a sickness, the protagonist says at some point, she cannot get rid of it in her head. Well if this book is the result I’m not sure I want to help her find a cure. Read this. Translate this. Grymmyger tilger aller landt, schedlicher ächter aller welte, freyssamer mörder aller lewte, jr Tot, euch sey verfluchet! got, ewer tremer, hass euch, vnselden merung wone euch bey, vngluck hause gewaltigclich zu euch: zumal geschannt seyt ymmer! Angst, not vnd jamer verlassen euch nit, wo ir wanndert; layt, betrubnüß vnd kummer, die laytten euch allenthalben; leidige anfechtung, schentliche zuversicht vnd schemliche verserung die betwingen euch groblich an aller stat; himel, erde, sunne, mone, gestirne, mer, wag, berg, gefilde, tal, awe, der helle abgrunt, auch alles, das leben vnd wesen hat, sei euch vnholt, vngunstig vnd fluchend ewiglichen! In bosheit versinket, in jamerigem ellende verswindet vnd in der vnwiderbringenden swersten achte gotes, aller leute vnd ieglicher schepfung alle zukunftige zeit beleibet! Vnuerschampter bosewicht, ewer bose gedechtnuß lebe vnd tauere hin on ende; grawe vnd forchte scheiden von euch nicht, wo ir wandert vnd wonet: Von mir vnd aller menniglich sei stetiglichen vber euch ernstlich zeter geschriren mit gewundenen henden! A great deal of effort is invested in the act of not writing poetry. You write a line, and another one, and a third, slower one and you are alarmed by the sour unmusicality of the stanza, and the overall lack of skill. So you strike them all out, get up, and take a walk down the street. After five minutes you reach the local bakery that has closed three times in the past year but appear to still serve customers. The person at the counter wears a paisley skirt and a look of defeat. I start writing a poem in my head as I am waiting for my loaf of rye bread. This is a bad sign so I leave without my bread, running down the street, and back up the stairs to my apartment. I do the dishes, breaking one out of every five plates into exactly twelve pieces. I sit down and stare at the wall, carefully not writing poetry. The act of not writing poetry, when you have no talent for it, costs a great deal of effort.